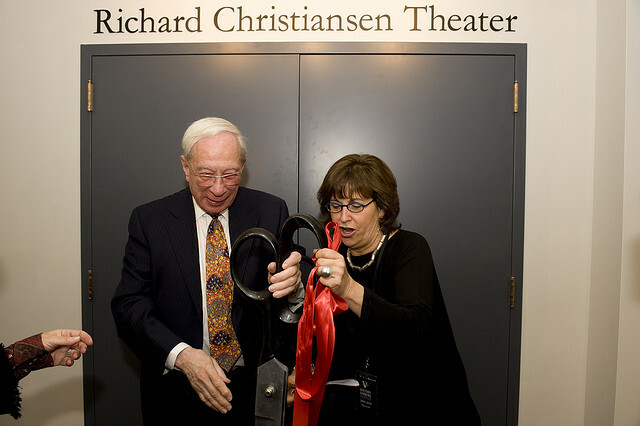 Richard Christiansen and Victory Gardens Executive Director, Jan Kallish, at the opening of the new theater in 2010. Richard Christiansen and Victory Gardens Executive Director, Jan Kallish. - The Goodman has cast Other Desert Cities, with Tracy Michelle Arnold (A Midsummer Night&apos;s Dream at CST), Tony-winner Deanna Dunagan (August: Osage County), John Hoogenakker (The Iceman Cometh), Linda Kimbrough and Chelcie Ross (Conrad Hilton on Mad Men) starring. Tickets go on sale December 7. - Zac Thompson recaps a few famous people sightings that have occurred in his life in and around the theater recently, including Mayor Rahm Emanuel, Harvey Fierstein and Cyndi Lauper, and Michael Shannon. "We celebrate [Jan&apos;s] decision to embark on another chapter of her career in the entertainment field," said Artistic Director Chay Yew in a statement, who joined under Kallish. "I know great things are in store for Jan wherever she lands next."